Y’all!!!! I loved Incarnate something fierce and I didn’t know how Jodi was going to keep up the momentum in Asunder! But she did! Asunder was another amazing journey into this beautifully written fantasy world where reincarnation exists and dragons, sylph, and other beasts are dangerous and deadly but, not as much as some of the people that surround Ana every day! Ana still struggles being a newsoul and what that means during this book and, she has the ever loyal and always swoon-worthy Sam by her side the whole time. I love Sam as much as I did in book one! Ana also has a set of loyal friends that we meet in book one who support her completely and we meet a new person Cris who stole my heart! Like I said I still love Sam but I love him for Ana. Cris is for me and he is just amazing! You’ll have to read the book to see why lol. And to answer some of the questions you have… will we see inside the Tower again? Yes. Will I tell you what happens? No. Is there romance between Sam and Ana? Yes and you will swoon. I do have to admit though nothing beats that scene from the Masquerade Ball in book one but, yes there are swoony scenes. Speaking of swoony scenes I wanted to share this one with you….. The day had been clear and cold, filled with questions. I hadn’t even known who he was then, just that he pulled strangers from frozen lakes. I wished he could pull me from the frozen shock now. “I remember,” I whispered. “You said not knowing what would happen if you died and didn’t come back. Where would you go? What would you do?” My gut twisted. I quite enjoyed Incarnate, so I'm glad the sequel is great as well. Looking forward to reading it now. Great review! Great review! Incarnate has been on my TBR for a while, but it kind of slipped down on the list. I'm thinking I need to move it up now that Asunder is out. Or maybe it's just that really great passage with Sam at the end of your post that changed my mid. Lol. That scene is so unbelievably swoon worthy!! I can't wait to read this! I loved Incarnate and it sound like this one totally lives up to it!! Fantastic review. 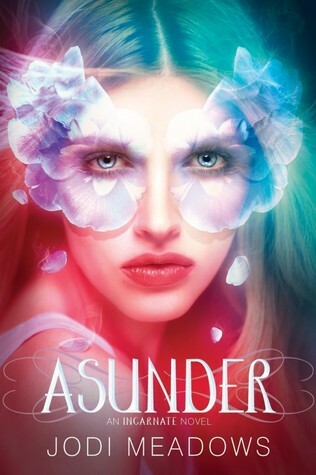 You have me super hyped up to read Asunder! !